3 Which are the most populated prefectures? 4 Which is the most densely populated prefecture? 5 Which is the largest prefecture? 6 Which is the smallest prefecture? Japan is divided into 47 administrative and legal divisions named todōfuken. In English, we usually refer to them as the 47 prefectures of Japan, with the term prefecture derived from texts written by 16th century Portuguese explorers and traders; Portuguese speaking men who used the term prefeitura to describe the fiefdoms they encountered in Japan. These are the 47 prefectures listed in alphabetical order. 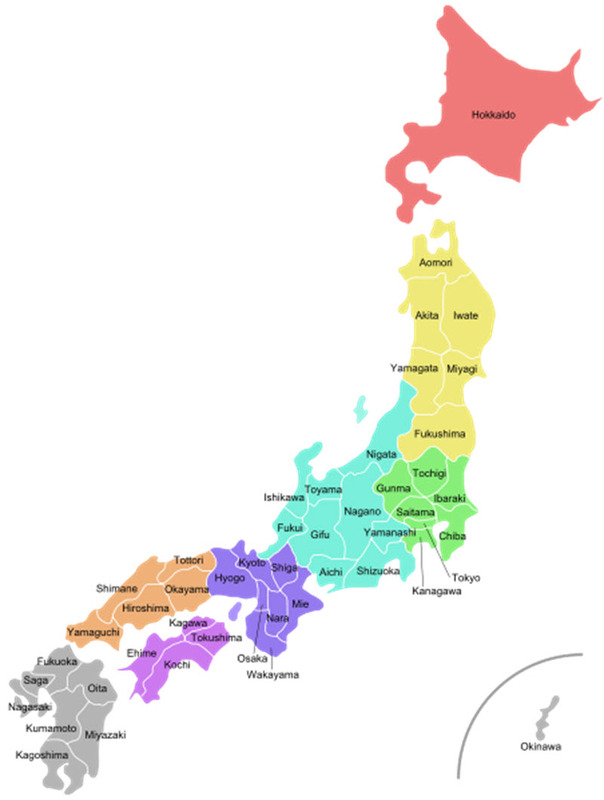 The 47 prefectures of Japan are commonly grouped into eight geographical regions called chihō. From north to south, they are: Hokkaidō, Tōhoku, Kantō, Chūbu, Kansai, Chūgoku, Shikoku, and Kyūshū. Which are the most populated prefectures? The most populated prefecture by a wide margin is Tokyo, which isn’t surprising since it includes the mega city Tokyo. In 2015, the Tokyo Prefecture was home to over 13.5 million people. On second place, we find the prefecture Kanagawa, which includes the major city Yokohama. In 2015, over 9.1 people lived in Kanagawa. On third place is the prefecture Osaka, which is an urban prefecture for the urban Osaka area. In 2015, this population size for this prefecture exceeded 8.8 million. Which is the most densely populated prefecture? Tokyo isn’t just the prefecture with the largest population, it is also the most densely populated prefecture. Data from 2015 show a population density of 6,168.1 residents per square kilometre for this prefecture. Which is the largest prefecture? The largest of the 47 prefectures is Hokkaido with 83,424.22 square kilometres. This is also the northernmost of the prefectures. Which is the smallest prefecture? The smallest prefecture is Kagawa, which is only 1,876.73 square kilometres in size. It is located on Shikoku Island in southern Japan.